^ Iron Man. British Board of Film Classification. 2008-04-09 [2016-04-23]. （原始内容存档于2016-05-13）. 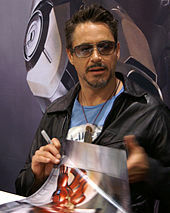 ^ 2.0 2.1 2.2 2.3 Iron Man (2008). Box Office Mojo. [2009-07-01]. （原始内容存档于2012-03-12）. ^ Iron Man (2008). The Numbers. [2018-05-06]. （原始内容存档于2018-03-04）. ^ 4.0 4.1 4.2 4.3 Bowles, Scott. First look: Downey forges a bond with 'Iron Man' role. USA Today. 2007-04-27 [2013-03-23]. （原始内容存档于2013-03-23）. ^ 5.0 5.1 Allsletter, Rob. Iron Man's Jon Favreau. Comics Continuum. 2008-03-03 [2008-03-04]. （原始内容存档于2014-06-08）. ^ 6.0 6.1 Svetkey, Benjamin. 'Lethal Weapon' Wunderkind (and Former Party Boy) Shane Black Is Back ... and Still Looking for Action. The Hollywood Reporter. 2016-05-13 [2016-11-27]. （原始内容存档于2016-11-27）. ^ 7.0 7.1 Ambrose, Tom. The Man in the Iron Mask. Empire. 2007-07-26: 69. ^ 8.0 8.1 8.2 Hewitt, Chris. Super Fly Guy. Empire. April 2008: 66–72. ^ Carroll, Larry. 'Iron Man' Star Robert Downey Jr. Talks About 'Incredible Hulk' Cameo, Controversial 'Tropic Thunder' Pics. MTV. 2008-03-18 [2008-03-18]. （原始内容存档于2010-01-17）. ^ 10.0 10.1 10.2 Shapiro, Marc. Pumping Iron. Starlog. 2008-04: 47–50. ^ 11.0 11.1 Iron Man Has Been Cast. IGN. 2006-09-29 [2014-05-30]. （原始内容存档于2014-02-22）. ^ 12.0 12.1 12.2 12.3 12.4 12.5 Quint visits the IRON MAN production offices! Art! Favreau speaks about sequels (?!? ), casting and more!!!. Ain't It Cool News. 2007-02-09 [2007-02-10]. （原始内容存档于2010-01-17）. ^ Rolfsen, Bruce. 'Iron Man' pilot to hit big screen. Air Force Times. 2007-03-21 [2007-03-22]. ^ Worley, Rob M. 'Iron Man': Terrence Howard lives the dream. Comics2Films. 2008-04-22 [2008-04-22]. （原始内容存档于2012-07-23）. ^ Rotten, Ryan. Iron Man: The Set Visit - Terrence Howard. Superhero Hype!. 2008-04-01 [2008-04-01]. （原始内容存档于2016-03-23）. ^ 16.00 16.01 16.02 16.03 16.04 16.05 16.06 16.07 16.08 16.09 16.10 16.11 16.12 16.13 16.14 16.15 16.16 Iron Man Production Notes. SciFi Japan. 2008-04-30 [2013-03-28]. （原始内容存档于2013-03-28）. ^ Adler, Shawn. 'Iron Man' Co-Writers Discuss Their Favorite Deleted Scenes, Plus An Exclusive DVD Bonus Clip. MTV. 2008-09-30 [2008-10-14]. （原始内容存档于2008-10-03）. ^ Harris, Scott. 'Iron Man 3': 7 Things You May Have Missed the First Time Around. Next Movie. 2013-05-06 [2014-12-26]. （原始内容存档于2016-03-01）. ^ Redding, Jordan. Iron Man 2008. Moviepilot. 2014-12-11 [2014-12-27]. （原始内容存档于2014-12-27）. ^ Douglas, Edward. Gwyneth Paltrow Plays Pepper Potts. Superhero Hype!. 2008-05-01 [2008-05-02]. （原始内容存档于2016-01-07）. ^ 21.0 21.1 21.2 21.3 Ebert, Roger. Iron Man (PG-13). Chicago Sun-Times. 2008-06-01 [2013-03-23]. （原始内容存档于2013-03-23）. ^ Iron Man Award Ceremony Narrator. Behind The Voice Actor. [2014-06-08]. （原始内容存档于2014-06-08）. ^ Itzkoff, Dave. Modern Marvel. The New York Times. 2011-03-25 [2014-06-08]. （原始内容存档于2017-10-10）. ^ Hugh Hefner. Biography.com. [2017-11-07]. （原始内容存档于2017-11-15）. ^ Goldman, Eric. Stan Lee's Further Superhero Adventures. IGN. 2007-05-04: 3 [2007-05-14]. （原始内容存档于2014-03-15）. ^ 26.0 26.1 Iron Man Ultimate 2-Disc Edition DVD, disc 2 (I Am Iron Man documentary) (DVD). Paramount Pictures. 2008. ^ 27.0 27.1 RAGE AGAINST THE MACHINE Guitarist Faces 'Iron Man'. Roadrunner Records. 2008-05-06 [2008-05-08]. （原始内容存档于2008-05-10）. ^ Neumaier, Joe. Jodie Foster Says ‘Money Monster’ Isn’t About Jim Cramer. Fortune. 2016-05-13 [2017-08-01]. （原始内容存档于2017-08-01）. ^ Dellaverson, Carlo. Cramer In 'Iron Man'. CNBC. 2008-05-02 [2008-05-08]. （原始内容存档于2008-07-06）. ^ 30.00 30.01 30.02 30.03 30.04 30.05 30.06 30.07 30.08 30.09 30.10 30.11 30.12 Douglas, Edward. Exclusive: An In-Depth Iron Man Talk with Jon Favreau. SuperheroHype.com. 2008-04-29 [2008-04-29]. （原始内容存档于2013-02-28）. ^ Ryan, James. Bam! Pow! Heroes take over the silver screen. Seattle Post-Intelligencer. 1990-04-14. ^ Smith, Andrew. Gen X kids not bad on screen. The Commercial Appeal. 1996-02-18. ^ Film Clips Column. The Journal Gazette. 1997-01-03. ^ Radford, Bill. Big screen gaining new ground as venue for comics creations. The Gazette. 1998-09-06. ^ 35.0 35.1 35.2 35.3 35.4 35.5 Iron Man (Archive). Comics2Film. [2008-10-01]. （原始内容存档于2006-05-03）. ^ Vice, Jeff. Comic books poised for film incarnations. Deseret Morning News. 1999-10-03 [2008-10-01]. （原始内容存档于2018-05-05）. ^ Smith, Andrew. Superheroes lining up for millennium movie debuts. The Commercial Appeal. 1999-12-26. ^ Epstein, Warren. X-guys could muscle up more Marvelous screen fare. The Gazette. 2000-07-09. ^ Richey, Rodney. Warner Bros. goes 'Bat' to the Future. Los Angeles Daily News. 2000-09-25. ^ Elder, Robert K. All work and lots of slay. Chicago Tribune. 2001-06-01. ^ Garcia, Chris. A firsthand look at 'Secondhand'. Austin American-Statesman. 2002-12-06. ^ Nick Cassavetes to Direct New Line Cinema and Marvel's Iron Man. New Line Cinema. 2004-12-10 [2006-07-28]. （原始内容存档于2006-11-14）. ^ Iron Man by Alfred Gough & Miles Millar, Revisions By David Hayter. Latino Review. 2006-04-24 [2008-03-22]. （原始内容存档于2008-02-05）. ^ Fritz, Ben. Marvel steels itself for 'Iron'. Variety. 2005-11-02 [2006-07-28]. （原始内容存档于2012-10-26）. ^ 45.0 45.1 Kit, Borys. Marvel Studios outlines slew of superhero titles. The Hollywood Reporter. 2008-04-28 [2008-03-22]. （原始内容存档于2007-10-11）. ^ Ferris, Glen. Empire: Interviews - Jon Favreau Video Interview. Empire Online. 2008-04-29 [2008-05-01]. （原始内容存档于2012-02-08）. ^ Marvel Studios: Building A Cinematic Universe (紀錄片). The Avengers Blu-Ray. 2012. ^ Worley, Rob. Jon Favreau talks Iron Man. Comics2Film. 2006-06-21 [2008-03-22]. （原始内容存档于2008-05-05）. ^ Jensen, Jeff. 'Iron Man': Summer's first Marvel?. Entertainment Weekly. 2008-04-17 [2008-04-21]. （原始内容存档于2013-03-28）. ^ 50.0 50.1 50.2 Johnston, Rich. Lying in the Gutters Volume 2 Column 156. Comic Book Resources. 2008-05-06 [2008-05-06]. （原始内容存档于2008-05-08）. ^ Worley, Rob M. Iron Man: Favreau on films, fans, and Fin Fang Foom. Comics2Film. 2007-09-08 [2007-08-08]. （原始内容存档于2007-09-30）. ^ Part 2 of Quint's interview with Jon Favreau! IRON MAN 2, Stark's alcoholism, Empire Strikes Back and THE AVENGERS!. Ain't It Cool News. 2008-10-29 [2008-10-30]. （原始内容存档于2008-11-03）. ^ Vejvoda, Jim. The Unknown Iron Man. IGN. 2006-05-24 [2006-12-06]. （原始内容存档于2014-03-13）. ^ AICN EXCLUSIVE!! IRON MAN Has Found Its Tony Stark!!. Ain't It Cool News. 2006-09-29 [2016-12-03]. （原始内容存档于2016-12-02）. ^ Eisenberg, Eric. Jon Favreau Details His Fight With Marvel Studios To Cast Robert Downey Jr. As Iron Man. Cinema Blend. [2016-12-03]. （原始内容存档于2016-12-02）. ^ 【復仇者聯盟】漫威電影十週年 《鋼鐵人》導演強˙法夫洛EW訪談 回顧漫威電影宇宙的光榮起點. 電影神搜. 2018-03-17 [2018-12-25]. ^ Terrence Howard cast in Iron Man!. Games Radar. 2006-10-12 [2016-12-03]. （原始内容存档于2016-12-02）. ^ Gwyneth Paltrow to Star in Iron Man. ComingSoon.net. 2007-01-17 [2016-12-03]. （原始内容存档于2016-12-02）. ^ Jeff Bridges Aboard Iron Man. Superhero Hype. 2007-02-05 [2016-12-03]. （原始内容存档于2016-12-02）. ^ Raab, Scott. May God Bless and Keep Robert Downey Jr.. Esquire. 2007-02-21 [2007-02-23]. （原始内容存档于2014-03-10）. ^ Funding Initiated for Iron Man Movie. Superhero Hype!. 2007-02-28 [2007-02-28]. （原始内容存档于2007-03-02）. ^ Favreau, Jon. Jon Favreau on Iron Man filming. SuperHeroHype.com. 2007-03-19 [2015-04-10]. （原始内容存档于2014-05-31）. ^ Flying with the stars. Edwards Air Force Base. 2007-04-06 [2007-04-16]. （原始内容存档于2013-03-28）. ^ Miles, Donna. Edwards team stars in 'Iron Man' superhero movie. United States Air Force. 2007-05-02 [2007-05-14]. （原始内容存档于2012-10-18）. ^ Rowley, Alison. 'Iron Man 3': Robert Downey Jr's Tony Stark seeks revenge in first clip. Digital Spy. 2013-04-05 [2013-04-23]. （原始内容存档于2013-05-02）. ^ First ‘Iron Man 3′ Clip Shows Tony Stark Taunting His New Enemy. Yahoo! Movies. 2013-04-05 [2013-04-23]. ^ Hall-Geisler, Kristen. The Cars in Iron Man's Garage. About.com. [2009-12-30]. （原始内容存档于2009-02-27）. ^ Giardina, Carolyn. 'Iron Man' crew had desired effects. The Hollywood Reporter. 2008-05-05 [2015-03-10]. （原始内容存档于2015-03-10）. ^ Favreau, Jon. Iron Man Movie Update!. Comingsoon.net. 2007-06-25 [2007-06-26]. （原始内容存档于2007-06-29）. ^ MCU成功的關鍵竟是來自小勞勃道尼的這句即興台詞. 世界電影. [2018-07-31]. （原始内容存档于2018-07-31）. ^ 71.0 71.1 Ahern, Sarah; Roshanian, Arya. What Jeff Bridges Learned From Difficulties on the ‘Iron Man’ Set. Variety. 2016-11-30 [2016-12-03]. （原始内容存档于2016-12-02）. ^ 72.0 72.1 72.2 Vary, Adam B. Jon Favreau talks 'Iron Man'. Entertainment Weekly. 2008-05-05 [2014-05-30]. （原始内容存档于2014-01-01）. ^ Who Designed the Iron Man Suit?. Superhero Hype!. 2007-05-06 [2007-05-06]. （原始内容存档于2007-05-08）. ^ Vespe, Eric. Quint goes one on one with Jon Favreau about IRON MAN at Comic-Con!!!. Ain't It Cool News. 2007-07-28 [2007-07-29]. （原始内容存档于2007-09-29）. ^ 75.0 75.1 快說！東尼史塔克的戰袍被誰偷走了？鋼鐵人裝甲「Mark III」失竊案. 電影神搜. 2018-05-25 [2018-08-07]. （原始内容存档于2018-08-07）. ^ 76.0 76.1 Melrose, Kevin. Original Iron Man Movie Armor, Worth $320,000, Is Missing. Comic Book Resources. 2018-05-09 [2018-08-07]. （原始内容存档于2018-06-17）. ^ Sciretta, Peter. Iron Man: Official War Machine Concept Art. Slash Film. 2008-10-21 [2008-10-22]. ^ Rotten, Ryan. Iron Man: The Set Visit - Jon Favreau. Superhero Hype!. 2008-04-01 [2008-04-01]. （原始内容存档于2008-04-02）. ^ Andrews, Marke. Vancouver's visual effects makers bulk up. The Vancouver Sun (Canada). 2008-04-11 [2008-04-12]. （原始内容存档于2013-02-23）. ^ Vespe, Eric. Quint visits ILM with Jon Favreau and sees some IRON MAN stuff!!. Ain't It Cool News. 2008-04-21 [2008-04-22]. （原始内容存档于2008-04-23）. ^ Larson, Randall. Of Superheroes and Predators: John Debney Returns to Sci-Fi. Cinefantastique. 2010-07-22 [2016-06-13]. （原始内容存档于2016-06-13）. ^ 82.0 82.1 82.2 82.3 Ramin Djawadi: Compositore di Iron Man. Comicus. 2008-04-06 [2016-06-10]. （原始内容存档于2016-06-09）. ^ Weedon, Paul. Ramin Djawadi on Game Of Thrones, Iron Man, Pacific Rim. Den of Geek. 2013-10-17 [2016-06-10]. （原始内容存档于2016-06-09）. ^ Boston, Rick. Iron Man Theme by John O’Brien and Rick Boston. Rick Boston Artist Musician. [2016-06-10]. （原始内容存档于2016-06-09）. ^ Iron Man (Original Motion Picture Soundtrack). iTunes. 2008-04-29 [2016-08-27]. （原始内容存档于2016-08-27）. ^ Iron Man Aussie Premiere Pics. Superhero Hype!. 2008-04-14 [2008-04-15]. （原始内容存档于2008-04-20）. ^ IRON-CLAD DATE: MAY 2, 2008. Marvel.com. 2006-06-23 [2014-02-06]. （原始内容存档于2014-03-10）. ^ Sciretta, Peter. Iron Man NOT Coming Early. /Film. 2008-03-12 [2014-02-06]. （原始内容存档于2014-03-10）. ^ 89.0 89.1 Iron Man (2008). Rotten Tomatoes. Fandango. [2018-05-08]. （原始内容存档于2018-03-28）. ^ Comic-Con: Jon Favreau's IRON MAN poster!!!. Ain't It Cool News. 2006-07-24 [2018-05-06]. （原始内容存档于2017-10-02）. ^ 91.0 91.1 Yamato, Jen. Surprise Iron Man Footage Knocks Comic-C. Rotten Tomatoes. Fandango. 2007-07-27 [2018-05-06]. ^ 92.0 92.1 Wiadomości: SDCC 2007: Film Iron Man, kolejne informacje. MarvelComics.com. 2007-07-29 [2018-05-06]. （原始内容存档于2018-05-06）. ^ Sciretta, Peter. Full 2007 San Diego Comic-Con Schedule Announced. /Film. 2007-07-09 [2018-05-06]. ^ Billington, Alex. Awesome New Iron Man Poster!. FirstShowing.net. 2007-10-04 [2018-05-06]. （原始内容存档于2015-07-15）. ^ Billington, Alex. TWO Final Epic Iron Man Posters Revealed - Updated!. FirstShowing.net. 2008-03-06 [2018-05-06]. （原始内容存档于2018-02-24）. ^ 96.0 96.1 96.2 96.3 Stanley, T. L. Tie-ins: LG, BK, 7-Eleven To Pump Paramount's Iron Man. Brandweek. 2008-01-07 [2008-01-08]. （原始内容存档于2008-01-13）. ^ Geddes, Ryan. Iron Man Film Cast To Voice Game. IGN. 2008-03-20 [2015-03-10]. （原始内容存档于2015-03-10）. ^ Graser, Marc. Studios suit up for Super Bowl. Variety. 2007-12-19 [2007-12-20]. （原始内容存档于2008-02-24）. ^ Billington, Alex. New Iron Man Superbowl TV Spot Debuts!. FirstShowing.net. 2008-02-03 [2018-05-06]. （原始内容存档于2011-07-02）. ^ Douglas, Edward. Hasbro Previews G.I. Joe, Hulk, Iron Man, Indy & Clone Wars. Superhero Hype!. 2008-02-17 [2008-02-17]. （原始内容存档于2008-02-18）. ^ Graser, Marc. 'Iron Man' rides with Audi. Variety. 2007-07-25 [2007-07-26]. （原始内容存档于2007-08-27）. ^ Gorman, Steve. 'Iron Man' gets heavy start at box office. Reuters.com. Reuters. 2008-05-03 [2008-05-04]. （原始内容存档于2008-05-06）. ^ Oracle is co-promoting Ironman. Oracle.com. [2008-05-02]. （原始内容存档于2008-05-05）. ^ Tobin, Paul. Paul Tobin on Iron Man: Fast Friends. Newsarama. 2008-10-20 [2013-05-03]. （原始内容存档于2014-07-20）. ^ Iron Man (2008). Metacritic. CBS Interactive. [2018-05-05]. （原始内容存档于2014-03-29）. ^ CinemaScore. CinemaScore. [2018-05-05]. （原始内容存档于2018-01-02）. ^ McCarthy, Todd. Iron Man. Variety. 2008-04-25 [2008-05-03]. （原始内容存档于2008-05-03）. ^ Honeycutt, Kirk. Iron Man. The Hollywood Reporter. 2008-04-28 [2008-05-03]. （原始内容存档于2008-04-30）. ^ Lovece, Frank. 'Iron Man'. Newsday. 2008-04-30 [2008-05-03]. （原始内容存档于2008-05-05）. ^ Gilchrist, Todd. Iron Man Review. IGN. 2008-04-29 [2008-04-29]. （原始内容存档于2008-05-05）. ^ Scott, A. O. Iron Man (2008). The New York Times. 2008-05-02 [2008-05-03]. （原始内容存档于2008-05-02）. ^ Edelstein, David. A Hero for Our Times. New York. 2008-04-25 [2008-05-03]. （原始内容存档于2008-05-06）. ^ Jones, J. R. Iron Man. Chicago Reader. [2018-05-06]. （原始内容存档于2017-11-30）. ^ Franklin, Garth. Review: "Iron Man". Dark Horizons. 2008-05-02 [2008-05-03]. （原始内容存档于2012-07-29）. ^ Denby, David. Unsafe. The New Yorker. 2008-05-05 [2008-05-03]. （原始内容存档于2008-05-01）. ^ Turan, Kenneth. 'Iron Man'. Los Angeles Times. 2008-05-01 [2018-05-06]. （原始内容存档于2017-12-09）. ^ Jenkins, David. Iron Man. Time Out. 2008-04-25 [2018-05-06]. （原始内容存档于2017-12-09）. ^ Opening Day Records at the Box Office. Box Office Mojo. [2008-05-03]. （原始内容存档于2011-07-06）. ^ Iron Man (2008) - Weekend Box Office Results. Box Office Mojo. [2008-05-04]. （原始内容存档于2008-05-04）. ^ 120.0 120.1 2008 Domestic Grosses. Box Office Mojo. [2018-05-06]. （原始内容存档于2017-09-22）. ^ Iron Man (2008). Box Office Mojo. [2008-06-25]. （原始内容存档于2008-06-25）. ^ DiOrio, Carl. "Iron Man" bolts past $300 million at box office. NewsDaily. 2008-06-19 [2008-06-25]. （原始内容存档于2008-06-27）. ^ Iron Man (2008) Foreign. Box Office Mojo. [2018-05-07]. （原始内容存档于2018-05-07）. ^ 2008 Worldwide Grosses. Box Office Mojo. [2018-05-06]. （原始内容存档于2008-12-04）. ^ Keck, William. MTV Movie Awards full of pomp, promotion. USA Today. 2008-06-02 [2015-12-18]. ^ 2008 Teen Choice Awards winners and nominees. Los Angeles Times. Arthur Ochs Sulzberger, Jr. 2008-06-17 [2013-08-06]. （原始内容存档于2008-09-12）. ^ Seijas, Casey. Comics Take Over '2008 Scream Awards' As Nominees Announced. MTV News. 2008-09-15 [2015-12-18]. （原始内容存档于2015-12-24）. ^ People's Choice Awards - 2009 Nominees & Winners. People's Choice Awards. [2015-12-18]. （原始内容存档于2009-10-27）. ^ 'Doubt' Tops SAG Pack. CBS News. 2008-12-18 [2015-12-18]. （原始内容存档于2015-12-22）. ^ King, Susan. USC Scripter Award nominations announced. Los Angeles Times. 2009-01-07 [2015-12-18]. （原始内容存档于2015-12-05）. ^ Bafta Film Awards 2009: The winners. BBC. 2009-02-08 [2015-12-18]. （原始内容存档于2015-12-22）. ^ Seijas, Casey. 'The Dark Knight', 'Iron Man' Rock The Grammy Nominations. MTV News. 2008-12-04 [2015-12-18]. （原始内容存档于2016-06-09）. ^ Iron Man Leads Visual Effects Society Awards Nominations. GamesRadar. [2015-12-18]. （原始内容存档于2015-12-22）. ^ Academy Award winners and nominees. CNN. 2009-02-22 [2009-02-22]. （原始内容存档于2009-02-24）. ^ Nickelodeon Unfolds Luminous List of 2009 Kids' Choice Awards Nominees. Nick KCA Press. 2009-02-06 [2009-07-01]. （原始内容存档于2012-02-25）. ^ Empire Awards 2009 Best Film. Empire. [2015-11-29]. （原始内容存档于2011-11-06）. ^ Empire Awards 2009 Best Actor. Empire. [2015-11-29]. （原始内容存档于2011-11-06）. ^ Empire Awards 2009 Best Sci-Fi / Superhero. Empire. [2015-11-29]. （原始内容存档于2011-08-14）. ^ 'Doubt' Tops SAG Pack. Taurus World Stunt Awards. [2015-12-18]. （原始内容存档于2015-12-08）. ^ MTV's 2009 Movie Award Nominations Are Packed With Comic Book Nods. MTV News. 2009-05-04 [2015-12-18]. （原始内容存档于2015-12-24）. ^ Nominations for the 35th Annual Saturn Awards. Academy of Science Fiction, Fantasy & Horror Films. [2009-03-17]. （原始内容存档于2012-02-29）. ^ "The Dark Knight" receives five Saturn Awards at the 35th Annual Saturn Awards. Academy of Science Fiction, Fantasy & Horror Films. [2009-07-11]. （原始内容存档于2009-07-11）. ^ 2009 Hugo Awards. The Hugo Awards. [2015-12-18]. （原始内容存档于2011-05-07）. ^ Ebert, Roger. The best films of 2008... and there were a lot of them. Chicago Sun-Times. 2008-12-05 [2008-12-09]. （原始内容存档于2008-12-08）. ^ Corliss, Richard. Top 10 Movies. TIME. 2008-12-09 [2008-12-09]. （原始内容存档于2008-12-10）. ^ AFI Awards 2008. American Film Institute. [2015-03-10]. （原始内容存档于2015-03-10）. ^ Empire's The 500 Greatest Movies of All Time. Empire. [2010-05-21]. （原始内容存档于2012-10-16）. ^ Empire's The 100 Greatest Characters of All Time. Empire. [2010-05-21]. （原始内容存档于2011-09-05）. ^ The 100 Greatest Fictional Characters. Fandomania.com. [2010-05-21]. （原始内容存档于2010-06-20）. ^ Ault, Susanne. Iron Man to kick off fourth quarter. Video Business. 2008-05-05 [2008-07-22]. （原始内容存档于2008-07-25）. ^ 151.0 151.1 Iron Man (2008) - Video Sales. The Numbers. [2010-03-31]. （原始内容存档于2018-03-04）. ^ Paris, Arthur J. It just keeps on getting better and better for 'Iron Man'. Rediff India Abroad. 2008-10-15 [2009-07-01]. （原始内容存档于2009-08-25）. ^ Kemp, Cal. IRON MAN Censored. Collider. 2008-09-17 [2008-09-19]. （原始内容存档于2015-07-10）. ^ Iron Man DVD (Review). Comics Worth Reading. 2008-10-05 [2009-07-01]. （原始内容存档于2012-08-02）. ^ 155.0 155.1 Lee, Jason. 'Marvel Cinematic Universe' 10-disc Blu-ray set announced. HD-Report. 2012-06-06 [2012-06-12]. （原始内容存档于2012-11-03）. ^ Breznican, Anthony. Briefcase lawsuit delays Marvel's 'Phase One' box set until next spring -- EXCLUSIVE. Entertainment Weekly. 2012-09-06 [2012-09-06]. （原始内容存档于2012-09-06）. ^ Finke, Nikki. So What Was All The Fuss About? Marvel Locks in Jon Favreau For 'Iron Man 2'. Deadline.com. 2008-07-09 [2012-08-03]. （原始内容存档于2012-08-21）. ^ Graser, Marc. Theroux to write 'Iron Man' sequel. Variety. 2008-07-15 [2008-07-16]. （原始内容存档于2012-08-24）. ^ Kit, Borys. Downey, Favreau sign on for "Avengers" at Marvel. The Hollywood Reporter. 2008-10-29 [2014-05-30]. （原始内容存档于2013-12-03）. ^ Gwyneth Paltrow returns Virginia 'Pepper' Potts in Iron Man 2. INQUIRER.net. 2010-04-22 [2012-08-03]. （原始内容存档于2012-08-21）. ^ Fleming, Michael. Samuel Jackson joins 'Iron' cast. Variety. 2009-02-25 [2009-03-30]. （原始内容存档于2012-08-21）. ^ Goldberg, Matt. Clark Gregg and Kate Mara Sign on for IRON MAN 2. Collider.com. 2009-04-23 [2012-08-03]. （原始内容存档于2012-08-21）. ^ Susman, Gary. 'Iron Man 2': Terrence Howard's out, Don Cheadle's in. Entertainment Weekly. 2008-10-14 [2012-08-03]. （原始内容存档于2012-08-22）. ^ Fleming, Michael; Graser, Marc. Mickey Rourke sizes up 'Iron Man 2'. Variety. 2009-01-07 [2012-08-03]. （原始内容存档于2012-08-21）. ^ Snider, Mike. First look: Mickey Rourke suits up as Whiplash for 'Iron Man 2'. USA Today. 2009-06-09 [2009-06-10]. （原始内容存档于2012-08-21）. ^ Warmoth, Brian. Sam Rockwell Confirms 'Iron Man 2' Role, Almost Played Tony Stark. MTV. 2009-01-15 [2009-01-15]. （原始内容存档于2012-08-21）. ^ Finke, Nikki. Another 'Iron Man 2' Deal: Scarlett Johannson To Replace Emily Blunt As Black Widow For Lousy Lowball Money. Deadline.com. 2009-03-11 [2012-08-03]. （原始内容存档于2012-08-21）. ^ Iron Man 2 Wraps on Schedule. Marvel.com. 2009-07-18 [2012-08-03]. （原始内容存档于2012-08-21）. ^ Iron Man 2: International Release Dates. Marvel.com. 2010-04-02 [2012-08-03]. （原始内容存档于2012-08-21）.